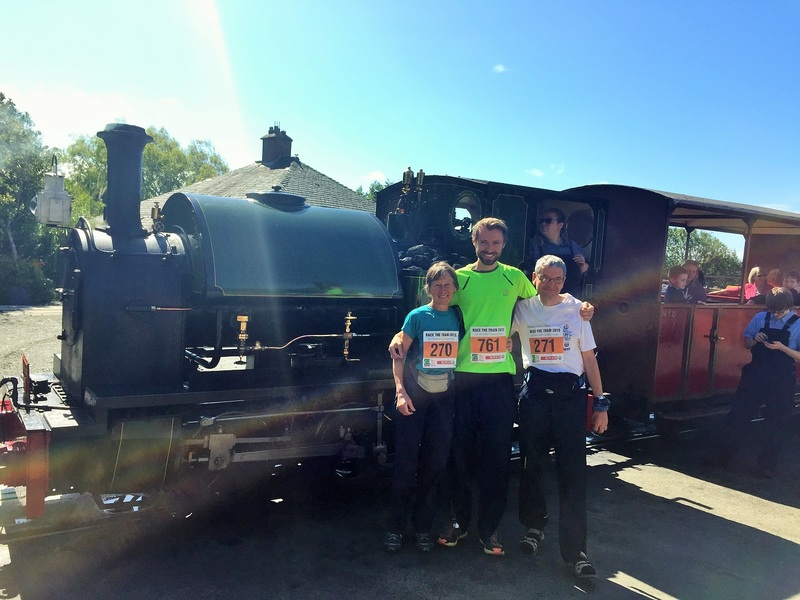 What better way to make up for years of missing trains than by running up and down a Welsh mountain faster than one? Well, being honest, I can think of a quite a few slightly less sadistic ways than that. 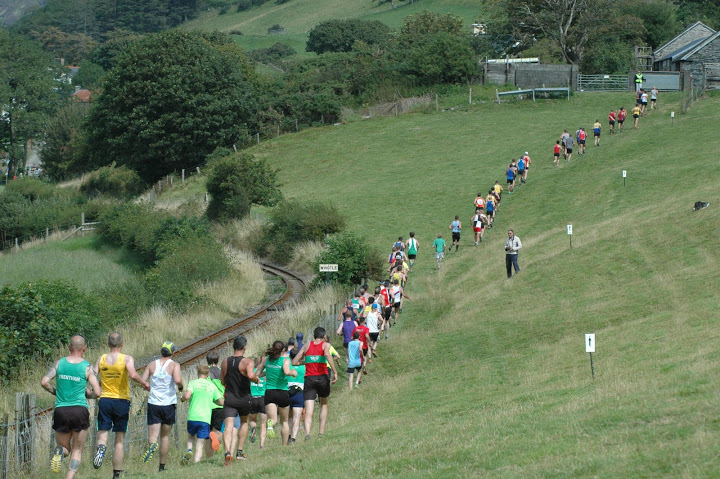 However, 32 years after I assume it was drunkenly thought up after one too many pints, Race the Train is going stronger than ever with 1,100 runners tackling its mental slopes, rabbit trails, fjords, animal carcasses and shoe-stealing-bogs this year. 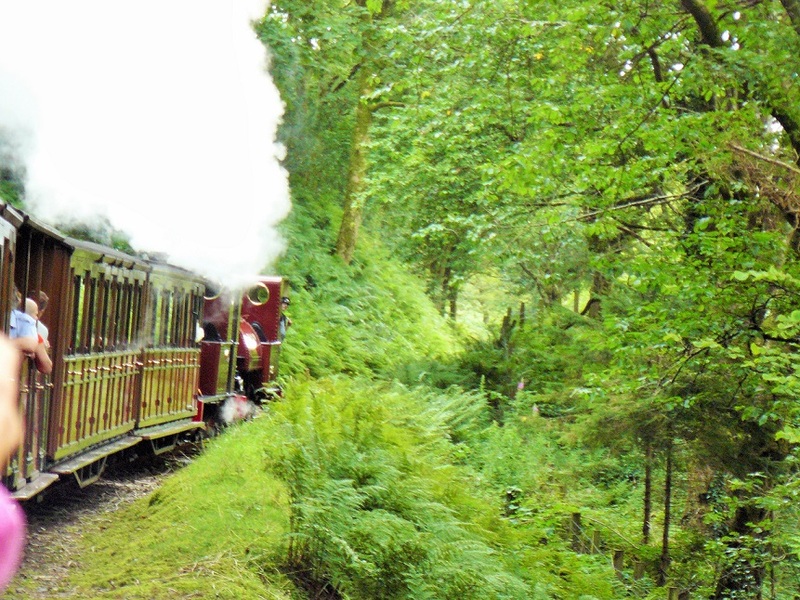 The premise is fairly simple: the 90 year-old steam engine takes 1h48 to go from Tywyn – a small coastal town in Snowdonia, to Abergynolwyn and back. Run the 14 miles (22.5km) faster: you win. Run slower: tough luck (and a huge medal). On paper, 22.5km in 1h48 should be fairly effortless these days. 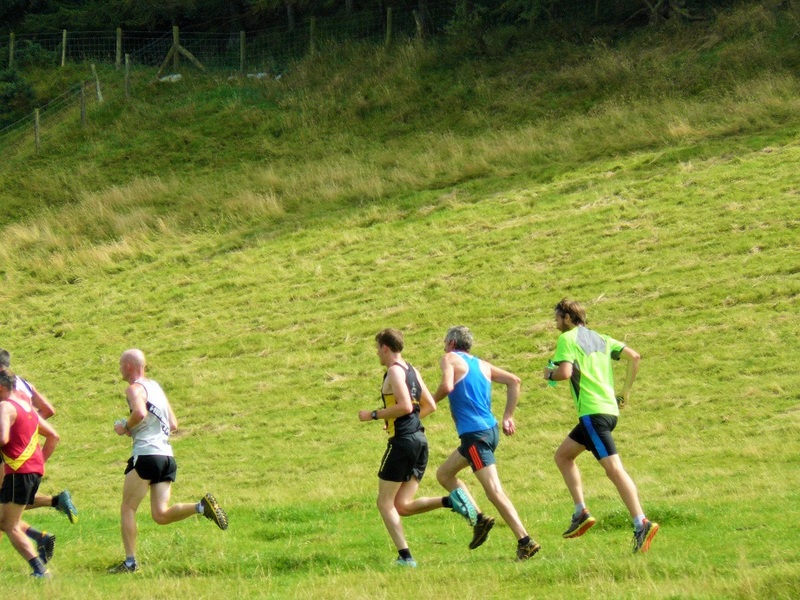 However, only 10-20% of runners beat it every year, in large part because the course is by far the hardest cross-country course I’ve ever done. Admittedly, because I have a hate-hate relationship with cross-country, I’ve only done a handful… but still. Hellish. After a morning spent dithering about and wondering what feeding routine we should adopt for an afternoon race (the answer: no-one knew), we were all set. At 2.05pm sharp, the train whistled, started puffing smoke and, just as the steam and soot engulfed us on the bridge, we were given the go ahead. At the front, the Welsh and English national teams set off like TGVs. Slightly more akin to a regional commuter train, I was a little more measured but still pretty speedy, as I knew I needed to bank every possible minute in the first half to make up for the second half, which was notoriously brutal. If I could stick to a 4.50 minute/km average over the whole race, I should be ok. 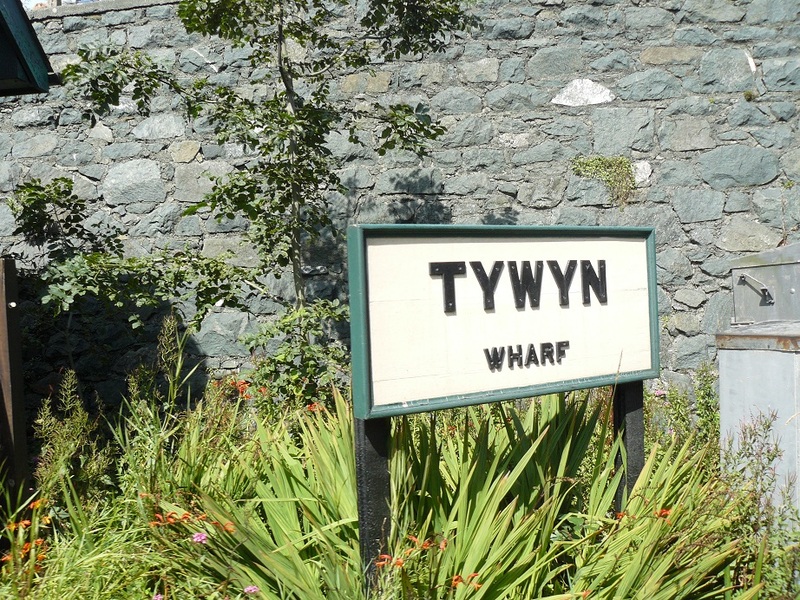 The first kilometre, on tarmac and slightly downhill was ideal and I zoomed through the narrow streets of Tywyn in 3m25s, greatly enjoying the placebo effect on my lungs that spending a week at high altitude in Ethiopia was having. Slightly behind me, my Aunt Katy and Uncle Chris were gunning for their respective W60 and M60 titles. The next couple of kilometres were equally suited to me: mostly tarmac or dirt track and mostly flat. After that, it went downhill (or, technically, uphill). The first unwelcomed obstacle was a fjord which, unless you were some sort of springbok or Jonathan Edwards, was simply impossible to avoid. There was only one option, which was to run ankle deep in the cold water and hope that there were no hidden rocks or potholes under the surface. There weren’t, but it didn’t make the next kilometre any more pleasant as the sloshing about in my shoes was rapidly turning my toes wrinkly and my foot-arch blistery. Shortly after this, the train’s chugging gradually got louder and louder and I could feel my nemesis creeping up on me. Eventually, it charged past me, heartlessly blowing its whistle at the same time. Runners’ families were on the train, waving and cheering as it went by (and, apparently, laughing at the poor lady runner who face-planted when she turned to wave). I took a few photos as I was clearly taking this race seriously although, with the course getting so much harder after this, this was the last time I’d take my GoPro out. 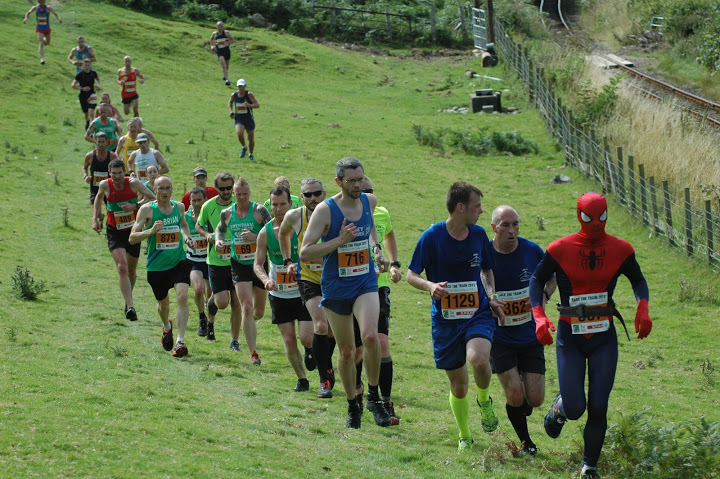 I was also slightly miffed that sodding Spiderman overtook me. As it happened, this was also the last time I saw the train in the whole race. However, all hope was not lost as the train still had to make a few stops along the way, including a ten-minute turning around stop which gave me some wiggle room. The rest of the first half was a gradual incline along grassy paths and farmland. It took in some beautiful views of the Welsh mountains but, using common sense, we were all far more focused on our feet than the scenery. Half way up, one of the sheep-gates was closed. Coming so soon after the fjord, it made the race feel a little too much like a muddy steeplechase for my liking. The return, which was mostly downhill after our 250m climb, really should have been easier but it was anything but that: fiendish, its muddy, steep and slow hills punished even the best (and especially the rest). Quite quickly, I started getting slightly concerned as the track became smaller, and smaller, and smaller until it was about the width of a shoe, with a reasonably sheer 5m slope on one side and barbed wire on the other. I quickly learnt how to run like a catwalk model with one foot delicately positioned in front of the other and we all spent the next couple of kilometres in a line, unable to overtake anybody (which, if I’m honest, I wasn’t about to do … but there might have been a few people behind me getting frustrated by my approach which involved putting limbs and health before speed). After a short while, the afternoon sun, which up until now was just trying to make us pull out due to exhaustion, turned its attention to a new obstacle: a partially decomposed sheep carcass. It’s hard to describe the smell of rotting meat mingled with boggy grass but … it was pretty bad. Eventually, the tiny path ended and we were back on something more suited to a human than a goat or a rabbit. As we neared Dalgoch Waterfall, I’d been warned that there was a bog we had to run through and to make sure my shoes were tightly fastened. As I casually strolled through a pitifully easy bit of mud, I thought the forewarnings were wildly exaggerating and that I had had nothing to worry about. Wrong. Very wrong. The actual bog was just around the corner and, ankle deep, you could just see it reaching out, ready to swallow brightly-coloured shoe after brightly-coloured shoe. Just as I thought I’d escaped it, I heard one final ‘gloop’ and ‘splotch’ and … bugger, where’s my shoe? One frustrating minute later and, suitably cobbled again, I was on my way. All that was left now was one more bog, one more fjord and 5 more miles of hills, one of which included a diagonal climb for half a kilometre up a 25 degree incline. 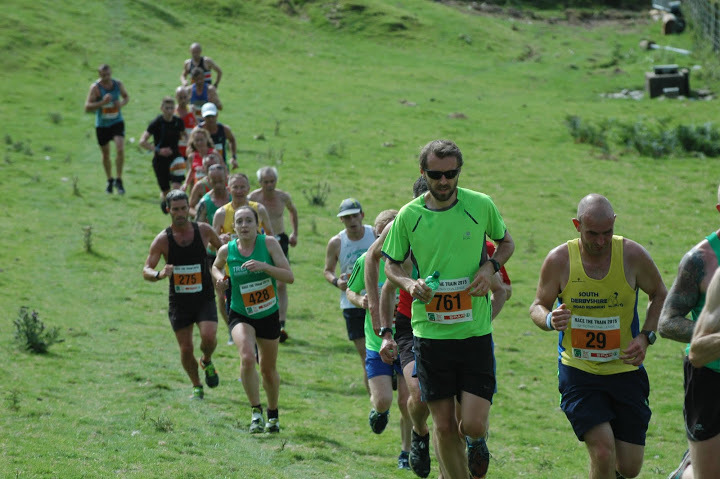 The only way up was to run like you had two clubbed feet – three days on and my ankles still hurt! If I’m brutally honest, I didn’t particularly enjoy the course: it’s simply too hard for a road-racing townie like me. 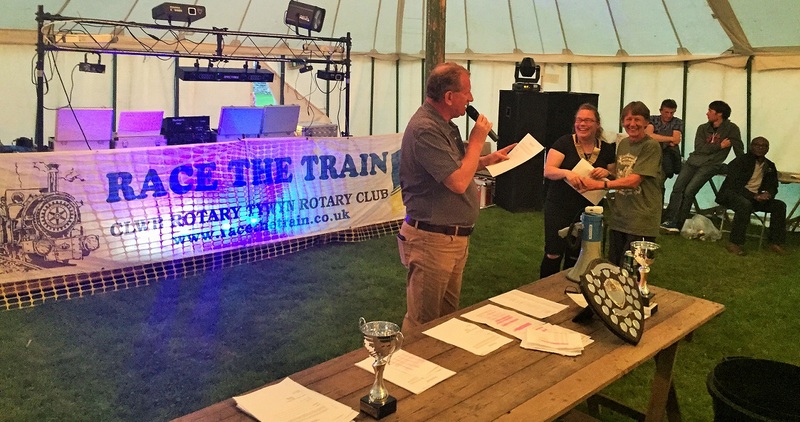 I train to race, but not to race a train (boo boom!). The added pressure of knowing what the maximum time you can run in actually adds quite a lot of stress too. With 8km to go, I had 40 minutes left. Normally, this is quite a pedestrian pace but not for this race, especially when the next kilometre was uphill at over 6min/km. I sped up a little where possible and outright sprinted the last kilometre and a half. Katy collecting her W60 award! And, lo and behold, I BEAT THE TRAIN! It was close – a mere 2 minutes, but that doesn’t matter. All that matters is that I won’t have to come back another year to try to beat it! To be fair to the race organisers, this is the perfect race for many runners. Just not me. I also can’t fault the organisation: good pre-race communications, pleasant atmosphere, well-marked course, lots of volunteers, lots of water, lots of photographers and a well-stocked goodie bag (although the Bran Rice Oil gift was a weird one). 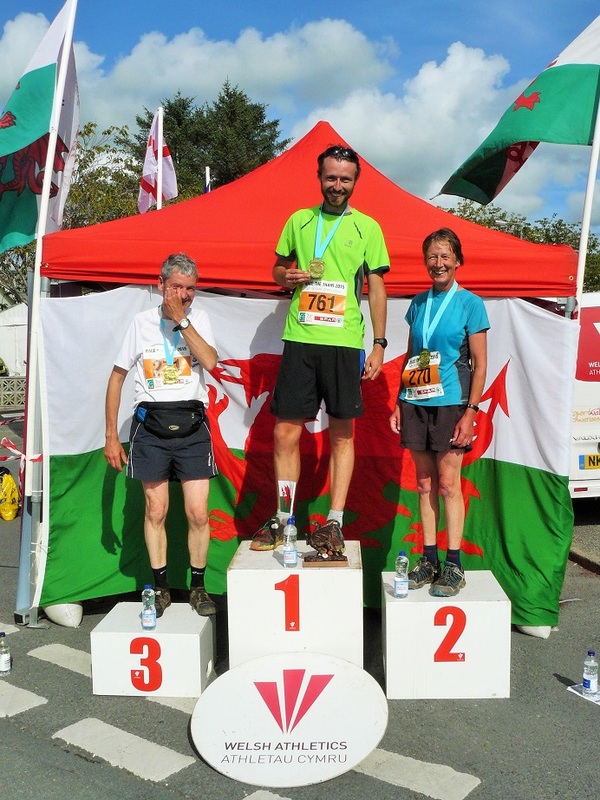 A few minutes after me, Katy stormed to victory in the Women’s over 60s race in 2.00.25 and Chris narrowly missed out on a top 10 position in his category a few minutes later. This was tough and certainly pushed me to my limits. What should I do next year? Race the wheelbarrow? Race the toddler in a pram? Race the tractor? 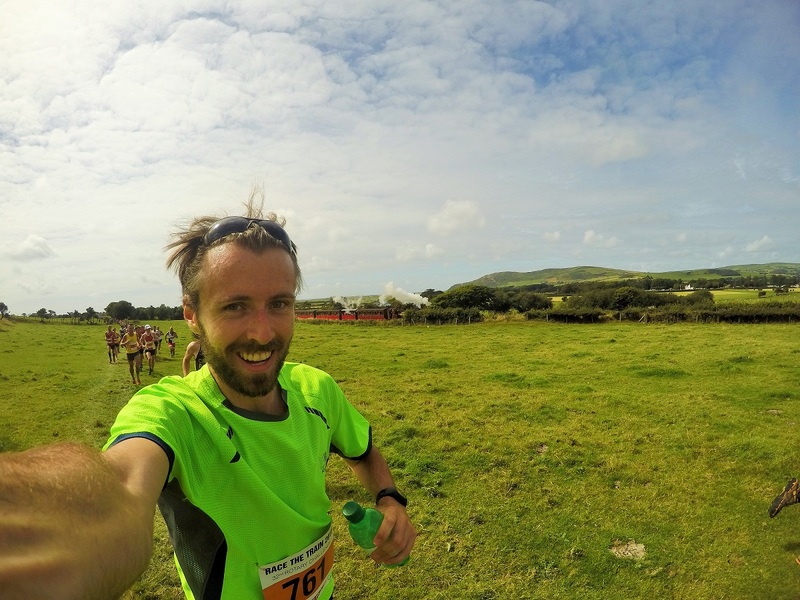 16:49 – sub-17 5k target broken!